The Arizona Diamondbacks head to Coors Field on Friday to take on the Colorado Rockies. The probable pitchers are Robbie Ray for the Diamondbacks and Jorge De La Rosa for the Rockies. The opening line for this game has Arizona at +117 and Colorado at -127. The over/under is 11. The Diamondbacks have a 76-52-5 over/under mark and a 51-82-0 run line record, meaning they cover 38% of the time. The Rockies are 73-60-0 against the run line and have a 62-67-4 over/under record. They cover the spread 55% of the time. The Diamondbacks head into this game with a 56-77 record, and they are 31-34 on the road. Starting pitcher Robbie Ray has a 7-12 record with an ERA of 4.28 and a WHIP of 1.43. He has 181 strikeouts during his 145 innings pitched and he has given up 153 hits so far this year. He has surrendered 9.5 hits per 9 innings and he has a FIP of 3.5. The bullpen this season has an earned run average of 5.08 and they have allowed 482 base hits on the year. Teams are hitting .270 against the pen while they've been struck out 410 times and walked 218 times this year. As a unit, Arizona has given up 9.8 base hits per nine innings while striking out 8.04 hitters per nine. They are 30th in the Majors in team earned run average at 5.12. The Diamondbacks pitchers have collectively given up 1,303 base hits and 681 earned runs. They have allowed 169 home runs this season and they allow 1.3 homers per nine innings as a staff. Arizona as a pitching staff has walked 499 batters and struck out 1,069. They walk 3.8 men per 9 innings while striking out 8 per 9. They have a team WHIP of 1.51 and their FIP as a unit is 4.57. As a team, Arizona is hitting .263, good for 7th in the league while putting together a .260 average on the road. The Diamondbacks have a .430 team slugging percentage and an OBP of .321 which is good for 15th in the league. They rank 4th in baseball with 9.22 hits per contest. Paul Goldschmidt comes into this game hitting .302 and his on-base percentage is at .419. He has 143 hits this season along with 86 runs scored and 78 runs batted in. He's struck out 116 times and has walked 95 times. Jean Segura is hitting .318 and he has an on-base percentage of .366. He has totaled 166 hits so far while scoring 80 runs and he's driven in 51. He has walked 30 times and has struck out 85 times. The Diamondbacks have 1,226 hits, including 234 doubles and 148 home runs. They've stolen 112 bases while they've been thrown out stealing 26 times. Arizona has walked 376 times this season and they've struck out 1,166 times as a unit. They've left 930 men on base and have a team OPS of .751. They score 4.56 runs per contest and have scored a total of 606 runs so far this year. Colorado comes into this game with a 34-32 home mark and a 64-69 overall record. With an ERA of 5.09, Jorge De La Rosa has a 8-7 record and a 1.54 WHIP. He has 90 strikeouts over the 115 innings he's pitched during which he has given up 126 hits. He has allowed 9.9 hits per nine innings and his FIP stands at 4.99. So far this season the bullpen has an earned run average of 5.02 and they have given up 459 base hits on the year. Teams are hitting .267 against the Rockies bullpen while being struck out 383 times and walking 165 times this season. As a team, Colorado has allowed 9.52 hits per nine innings while striking out 7.51 batters per nine. They are 27th in the league in team earned run average at 4.90. The Rockies pitchers as a team have surrendered 1,241 base knocks and 638 earned runs so far this season. They have given up 142 home runs this year and they give up 1.1 home runs per nine innings as a staff. Colorado as a staff has walked 448 hitters and struck out 980. They give up a walk 3.4 times per 9 innings while they strike out 7.5 per 9. Their team WHIP is 1.44 while their FIP as a staff is 4.32. As a team, they are batting .275, good for 2nd in the league while putting together a .304 average at home. The Rockies hold a .460 team slugging percentage and an on-base percentage of .339 which is good for 3rd in baseball. They rank 2nd in baseball with 9.51 hits per contest. Carlos Gonzalez comes into this matchup batting .303 and he has an OBP of .354. He has 144 hits this year along with 77 runs scored and 83 RBI. He's struck out 104 times and has walked on 38 occasions. 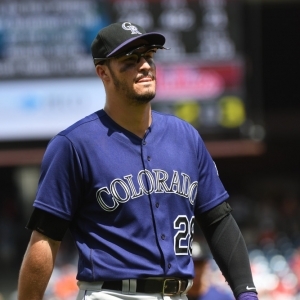 Nolan Arenado is hitting .294 and he has an OBP of .365. He has collected 149 hits so far while he's scored 98 runs and drove in 115. He has earned a walk 59 times and has punched out 76 times. The Rockies as a unit have 1,266 base hits, including 265 doubles and 170 homers. They have 57 stolen bases while they've been thrown out 33 times. Colorado as a team has walked 426 times this year and they have struck out 1,081 times. They've had 903 men left on base and have an OPS of .799. They score 5.33 runs per game and have totaled 709 runs so far this season.